The Lecoq School is the leading contemporary exponent of the evolving Copeau tradition, with enormous influence and the highest international reputation. Besides actors on film and stage all around the world, such as Geoffrey Rush, former Lecoq students include world class directors such as Ariane Mnouchkine of Théâtre du Soleil and Julie Taymor, creator of the Disney musical stage production “The Lion King,” and playwrights of the calibre of Yasmina Reza (“Art”). The Lecoq School has also produced its own share of next-generation theatre pedagogues. I have been asked how it was to be a student of Lecoq. Well it was certainly damned hard work; one was constantly confronting one's own limitations. Lecoq’s application of the ‘via negativa’ kept his students in a state of almost constant frustration, but the process selected for passionate, resilient artists. And of course it was inspiring, to be presented with a new universe that existed both as creative fantasy in the surrounding dramatic space, and as concrete reality inside my own body. 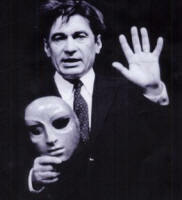 Lecoq's work followed from his belief that theatre needed to return to its roots to revalidate itself. He taught how to find inspiration and fundamental truths in Nature. He taught the performer to work from what the body CAN do, and NOT toward an abstract aesthetic of what one might WANT it to do. He taught that the actor, as much as the playwright and director, has a responsibility for transforming reality, raising it to a "niveau de jeu," not just imitating it. He taught that style should be drawn out of the energies of the actor and not simply imposed from above by the director. If acting is cooking, Lecoq taught how to use spices, and in which order to place the courses of the meal. He was a master of salads, cheeses and wines. He didn't teach so much about how to prepare the meat and potatoes, which is why his students often benefited from also having other more conventional influences. Above all he taught good taste. He educated the palate. Although Lecoq provided a specific, narrowly focused training, I found that he left me with a solid handle with which I could eventually open a lot of other doors. There is no right way to do theatre. But if one’s basic education is built around many different inputs, (the so-called “supermarket approach” that universities, by definition, are expected to pursue), one is denied a strong, fundamental reference point for approaching other mysteries. Lecoq's successful former students have never been carbon copies of the Master, and one even has a hard time to discern any shared aesthetic among them. The very originality that Lecoq encouraged in his students deflected the attention away from himself. And he was very late in documenting his ideas. It fell to his students and students of his students to get the ball rolling, notably Ralf Yarrow and Franc Chamberlain ("Jacques Lecoq and the British Theatre" - Routledge - 2002); Simon Murray ("Jacques Lecoq" - Routledge 2003); Mark Evans ("Movement Training for the Modern Actor" - Routledge 2009). Simon McBurney told me of a project he had begun, interviewing Lecoq using the parts of the body as a guide. "Alright Jacques, now tell me about the heel." What a brilliant approach; an anatomy of theatre mapped onto the human body! Eventually, Lecoq's one book, "Le Corps Poétique," was as much memoir as manifesto. As I struggle now with this Glossary, I am reminded of a conversation I once had with Lecoq about how putting one's ideas down in print is like sticking metal pins through living butterflies, fastening them to a dull collection of dried insects sealed inside a glass cabinet. He found it very difficult. His whole life was about movement, and even ideas have to keep moving.